As I mentioned in my last post, Friday was a very important day for Nepalise people. We could sense the anticipation and excitement as the morning wore on. 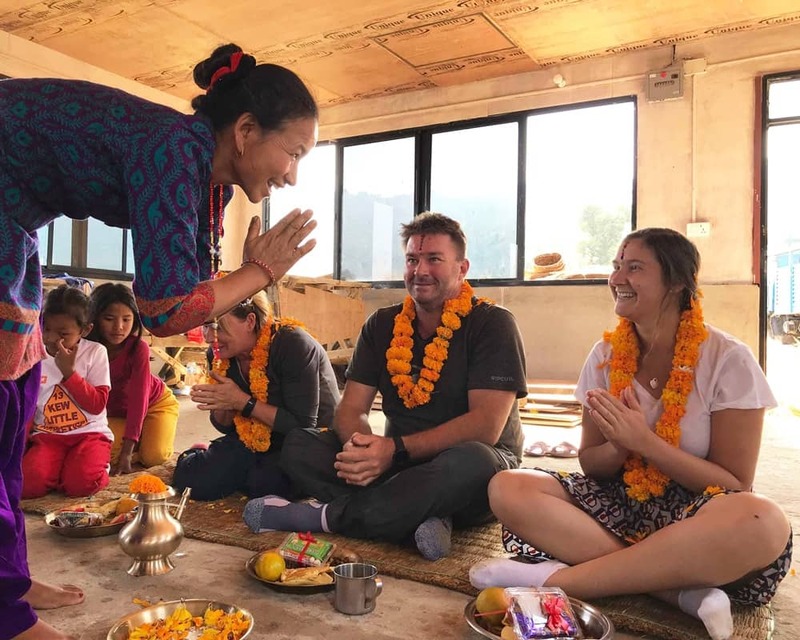 Just before midday we (myself, Shaun and Shannon – another Aussie who has found herself in Batase and will be coming to Base Camp with us) were invited to join the Tamang family in an almost finished building (which will soon become the new library) for the ceremony. Not sure what to expect we were ushered onto a grass mat alongside the Tamang brothers. 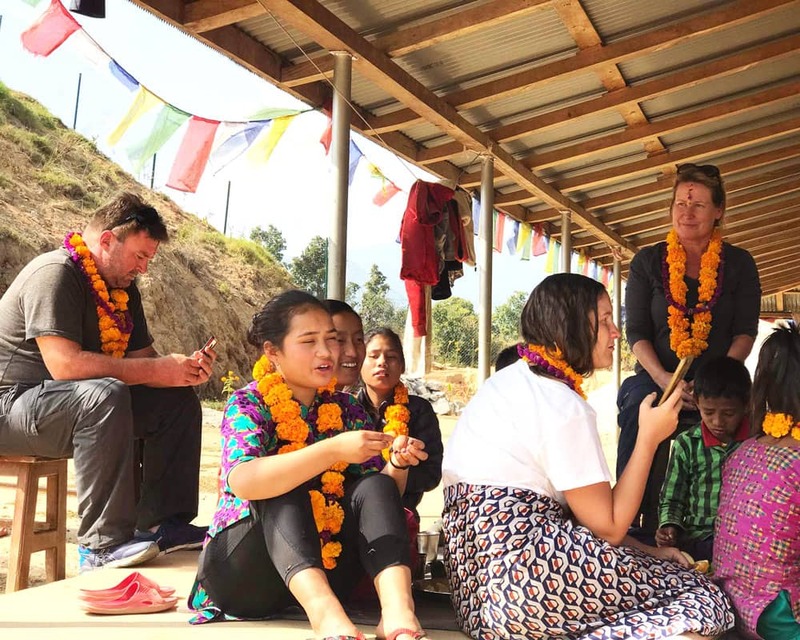 The story goes that many years ago a Nepalise soldier was sent off to war but he was granted permission to see his sister before he left as he had not seen her for a long time. His sister presented him with flower garlands and blessed him with 7 tikka colours on his forehead. He went away, survived and lived for many years. The ceremony started with the sisters sprinkling water and wafting smoking embers in a circle around the brothers. 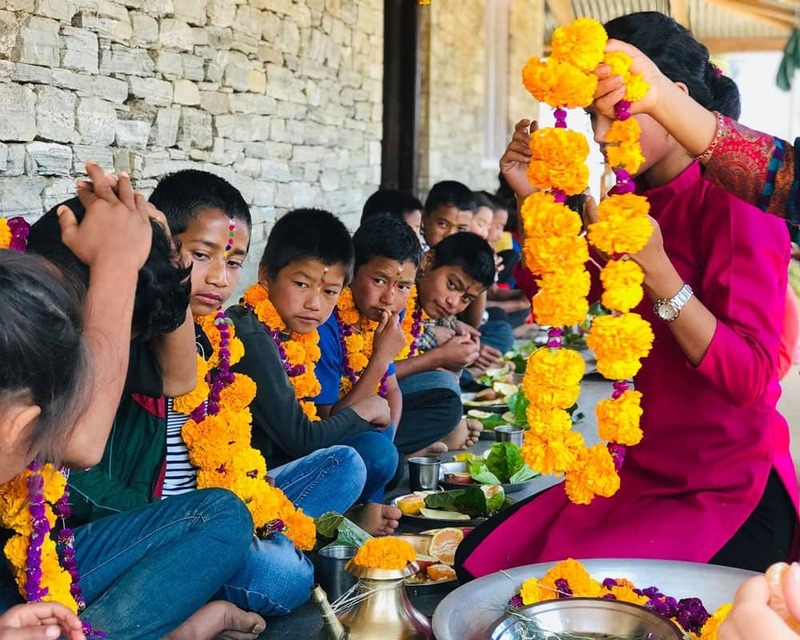 One of the sisters – Anjana, dotted 7 coloured tikka dots on her brother”s forehead and then draped beautiful flower garlands around their necks.The brothers then cupped their hands and water was poured into them from what looked.like a genie’s lamp. They sipped the water from their hands and then ran the rest through their hair. They were then presented with a plateful of food and drink. The ceremony takes into account people who have no siblings with them, so much to our surprise we were honoured and humbled when the sisters also performed the ceremony on us. 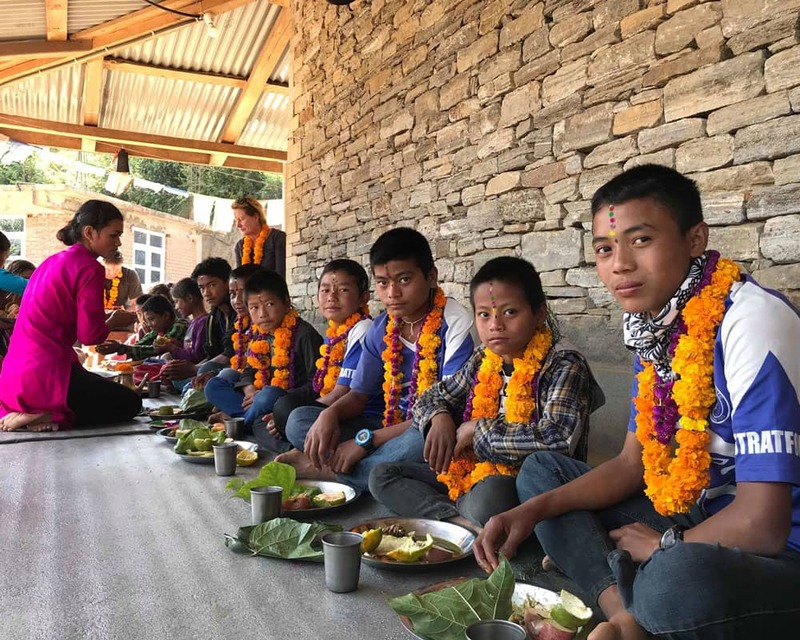 After eating, the whole family made their way to the hostel where all the children were waiting patiently on grass mats. 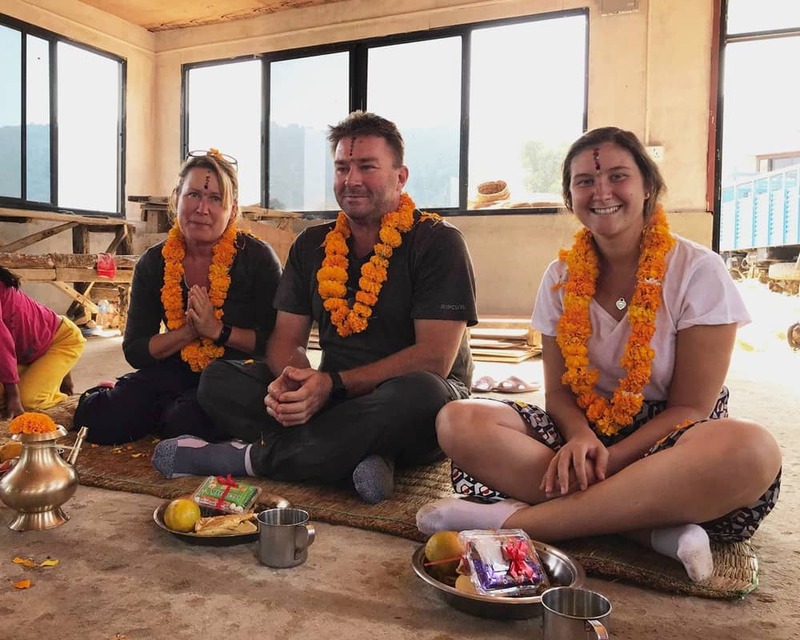 The girls who have brothers in the hostel performed the ceremony on their brothers and the other children were also presented with garlands and decorated with tikka. We had noticed that some children were not included and found out that if a family member had died within the past year they were unable to take part. Not for the first time since being here I could not stop the tears and it was time to put the sunnies on again.I also knew that the day was particularly poignant for Shaun because of the loss his brother earlier in the year and he had been thinking of his other siblings all day. After the children had eaten, the afternoon then became one of dance, song and celebration. One of the older girls Rabinah described it as the best day ever. By about 4 everyone was pretty worn out and we all had a bit of a siesta. included in such an important day and how much it meant to us to be part of it. Not sure they understood. After the presentation some one started a massive tickle fight. The kids were roaring with laughter as they ran around digging strong little fingers into waists and arm pits. After presentation it is dinner time and then pretty much bedtime. There are no Tv’s, limited wifi and only the adults have phones so everyone goes to bed after dinner and gets up with the sun. Flying into Lukla Airport- 5 Interesting Facts.